Hi Finds of the Fair readers, I’m Wayne of All Our Yesterdays. If you don’t know me from my regular stall at the Vintage Village, near the ‘glass bus stop’ you might know me from my two foot tall top hat, grey beard and my waistcoat adorned with vintage badges. I have been collecting since I was eleven, which was when I found the Corn Exchange in Manchester near the Victoria train station, and I also remember going to one of the last fairs at Belle Vue before it closed. This means I have been collecting for just over 40 years. Sarah asked me to be Finder of the Fair for the Fifth Birthday Bash, not before time. In fact it was not my fifth birthday at VV as I started in October 2010, so it’s my fifth Birthday next month. I was set up early and had help from both my son and nephew manning the stall (thanks boys) so I crashed on with my important task. Gem’s Bits and Bobs is always a favourite stall of mine. This month she had a tin tub full of 1960s melamine cups and saucers plus much more, some shapes of which I had never seen. They had been in her Nain and Taid’s (grandma and grandpa's) shed on their Welsh farm for over 40 years. Needless to say these were moving fast. This was just too unusual to miss. How often do you see a four foot tall sign of a baby in nappies? It was reckoned to be from the side of a van advertising Pampers in the 1980s. On the same stall I also found a 1950-60s tin plate toy telephone reception by Codeg for £20.00. I love vintage toys and this was no exception, I could just image playing with this in the 1960s. A great pair of Shorter and Sons cruets in the shape of ducks. These were on Rita Blacks’ stall and would make a great addition to your breakfast table, especially for your boiled eggs, £10.00 and you could take these home. You can always find great furniture on Whittaker & Gray’s stall, all fantastically restored, and there are usually lots of colourful items. I found this functional teak coffee table on Dansette legs with a secret compartment. You would never need to look for the remote again if you had this handy storage. This was an unusual find and without the box it would take ages to work out what this was. It’s a knitting ball holder from the 1920s and would be a great conversation piece at any party. I had a long discussion over RD numbers with the ladies from the Blythe House Hospice stall. They have charity shops in Buxton, Whaley Bridge, New Mills, Chapel en le Frith and Fairfield, and I think I have visited most of them in the past. The shop at Whaley has a special vintage section and is well worth a visit. Note RD numbers are the registered design numbers which can help you date an item. 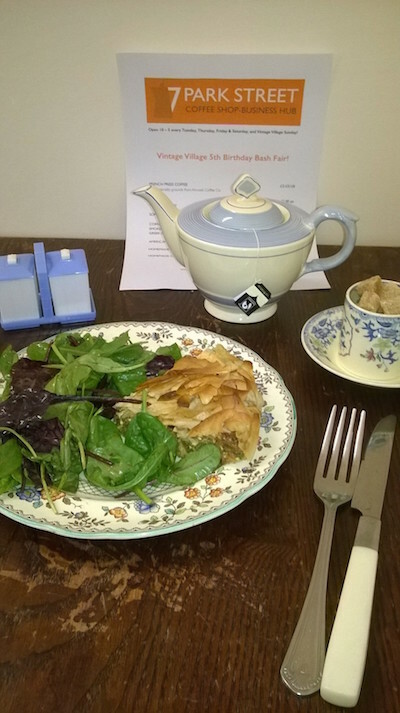 Whilst at 20th Century Stores I had to call into their new addition, 7 Park Street, Coffee Shop & Business hub, where I just had to try the vegetarian option of Greek style spinach and feta pie - very, very tasty. The front of the shop still needs filling but don’t let that put you off, the coffee shop is very much up and running, and I have it on good authority that the front of house is not far behind being finished. Well that’s me and hope you like my Finds. Let’s hope its not another five years before Sarah asks me back as Finder of the Fair. Don’t forget to come and see me at the next fair on Sunday 11th October, even if it’s just to wish me Happy fifth Birthday - Wayne. This was on VV newbie, Lyndsey Hewitt-Dutton’s stall. I am an avid collector of vintage Disney, so this French Donald Duck Disney cube set was just up my street; six puzzles of Donald, his nephews, Mickey, Minnie, Uncle Scrooge and even Pluto shows his face. At £15.00 this found its way home with me. Do not adjust your sets, this is not a chair for a Barbie doll but a 1960s child’s chair with an extra large label. This was on Dabberdecades’ stall and was another of my finds of the fair which found a new home. Not long after I took my photo it was snapped up. Another of my favourite stallies, Kristy of Agnes Darling, made a much welcomed return to the fair. As long as I can remember we have been buying from each other, we must both have such good taste. Early on I spotted this Fisher Price push along horse on Kristy’s stall, plus a Fisher Price Kermit the frog for £25.00. Kermit was soon snapped up by another trader and sat proudly on her stall all day as her lucky mascot. Let’s hope Kirsty comes back soon. This great Find was on New Patina’s stall and after I helped Tony display this 1960s plant stand better - it was the wrong way round - I would like to think I helped sell it. However, at only £24.00 it was not going to stay long, and later I saw another of my Finds walk out with a new owner. It was my display skills that helped, honest it was, Tony. Three great Galt Puzzles in their boxes (price not disclosed), made in Stockport from the company which has its headquarters in Cheadle, from the lovely Elaine and Bill of Allsortz. These will be a great addition to my stock and will be on sale at the next fair. A VV would not be the same without a visit to 20th Century Stores and what a Find I had at Tin Trunk from the lovely Sarah; a fantastic Marx Disney bagatelle game. Me and my children have been playing with it ever since (700 is my top score so far). Sarah is another one with good taste and we are always buying off each other. This mini case was a purchase Sarah made from me at a previous fair, before becoming a great advert for her shop. Summer is still hanging in at Lucy’s stall. I found these flowery items at Parrot in the Pantry - flowery glasses, headbands or hair clips - all reduced to £2.00 each. What a bargain, cheap enough to buy and put away until next year. PS don’t tell my daughter. Don't you just want to go shopping with Wayne at the next Vintage Village? Thank you, Wayne, for such a charming, amusing and distinctive selection and we'll see you next month on your VV fifth birthday! PS Here's Wayne's All Our Yesterdays page on Facebook.